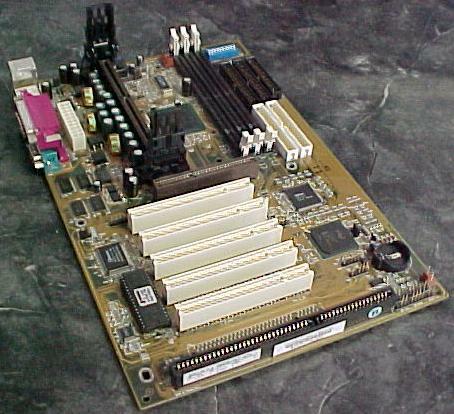 A long time ago, trading hardware ran rampant between my friends and I. I traded a KVM switch complete with cables for this motherboard. It came with a processor too, and it wasn't just any processor it was a Pentium 3 on a slocket. Not only did it have a rock solid overclock, Jeff had flashed the BIOS so that it would make use of the High Point HPT370 Raid controller. This board was the back bone of my file server for many years before it died. Which leaves me with the task of finding a new HPT370 controller so I can get all my data back. This board served me well I raise my glass high. This one's for you Jeff. Its been a while since I did a Geek Memorabilia segment so I thought I'd post links to the first two. Next time on my blog: What James does with old motherboards before he throws them out. You mean... what your girlfriend does to the chipsets she can get her hands on before you throw them out. Bwahaha. Hey, I'll trade you an ISA network card for that board. Or if you prefer, the fan off of Dad's old athlon that I used to use to cool my video card. Man I loved that board, what a trusty piece of electronics it was. I couldn't have found a better home for it. I'll take a trusty piece of hardware over a new, fast, unstable piece any day.